This artist's concept shows NASA's Dawn spacecraft orbiting the giant asteroid Vesta. Exploring a new world is always a lot more interesting than the business of getting there. Each destination is different, after all  Mars isn't Jupiter which isn't Enceladus which isn't the sun. But as for the spaceships themselves? No so much that's unfamiliar: a collection of engines and thrusters and instruments and a lot of explosive fuel. That, at least, has been the rule. But that rule has changed  thanks to the Dawn spacecraft. You may never have heard of Dawn, and if you haven't, you're not alone. In a solar system full of dazzling bodies, its destination is nothing more glamorous than an asteroid  two of them, actually. And as a descendant of a long line of spacecraft designed to fly very, very fast, Dawn flies very, very slowly  or at least it accelerates that way. But that very pokiness is part of its genius, and the dazzling new stream of pictures and other data now pouring back from the first half of Dawn's journey is proving that the NASA engineers knew just what they were doing. Dawn was launched in 2007, on a slow journey to the asteroid Vesta and later, to its bigger sister Ceres. Vesta is the second largest body in the asteroid belt  about 360 mi. (578 km) across, or roughly the size of Arizona. When the Delta rocket that blasted Dawn into space and then out of Earth orbit was spent and discarded, the craft was moving at an impressive 25,000 mph (40,000 k/h) clip  fast, certainly, but more speed still would be needed to get the ship out to the asteroid belt, into orbit around Vesta, then out of orbit and onto Ceres. All that flying and maneuvering takes a lot of fuel, which can add weight and drive up mission costs. The answer: replace chemical fuel with light xenon gas  about 270 liters of it, which is small by spacecraft standards  and then use that fuel very sparingly. The key to that was ion propulsion technology, which is just as cool as it sounds. Two large solar panels, measuring 65 ft. (19.7 m) from one tip to the other, gather power from the sun and then ionize the xenon, accelerating it through the engine's exhaust and providing thrust. Any old noble gas would do for this job  helium, neon, argon, krypton  but the xenon ion is the most massive of the group, as atoms go, and thus creates more thrust. Of course, just as "massive" is a relative term, so is "more thrust." The stream of xenon ions coming from the engine bell produces a thrust of just 91 millinewtons, or about the force a piece of paper exerts on your hand when you pick it up. That's a little bit shy of, say, the 7.5 million lbs. (3.4 million kg) of thrust the Saturn V produced when it blasted off the pad. But physics plays a long game. Not only is ion propulsion economical, burning less than 3 milligram (.0001 oz) of fuel per second, the featherweight thrust it produces is cumulative. The engine burns more or less constantly on its outward trip  stopping only for eight hrs. once a week so that the ship's main antenna can be aligned toward Earth for a status report. Still, even such constant thrusting adds only 15 mph (24 k/h) per day, or zero to 60 in four days,  not exactly flooring it. Over the course of 67 days, however, that adds up to an additional 1,000 mph. That's a lot in a journey through the solar system, since spacecraft don't typically make a straightahead, as-the-crow-flies trip to a destination, but rather go into orbit around the sun and then gently add velocity so they spiral out to where they're going. "Over the course of years we sculpted the orbit," says Marc Rayman Dawn's chief engineer and mission director. "By the time we got to Vesta we were essentially in the same orbit as the asteroid, approaching it at a relative speed of 60 mph." That was back in August, when Rayman's team tweaked the ion thrusters so that the spacecraft could descend into orbit around the asteroid. Dawn is now barnstorming Vesta, flying at a very low altitude of 130 mi. (210 km) and the images it's returned have been suitably extraordinary  revealing bright surface material splattered around craters from long ago meteor strikes, and less-disturbed stretches of more pristine landscape. This provides clues to the asteroid's interior and about the primal forces that shaped it 4.5 billion years ago. "One of the things that's cool about Dawn is that we're exploring uncharted worlds," says Rayman. "We say that Vesta has a diameter that's roughly equivalent to Arizona's, but remember it's a three dimensional body and we're orbiting it. So overall we're studying an area twice the size of California." And compared to the next destination, even that's small. Ceres, the largest object in the asteroid belt, is 590 mi. (950 km) across and should have an even more variegated surface. 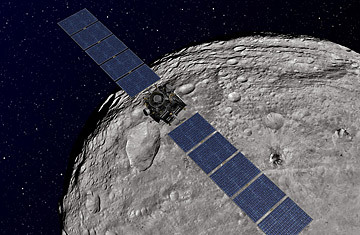 Dawn will arrive there in Feb. of 2015 and spend 5 months studying the asteroid up close. By then, the mission is scheduled to be bought to a close, its funding  if not the spacecraft's fuel  expended. Whatever Dawn discovers about Ceres and Vesta, however, it's already proven the larger point that after half a century of blast-and-go spacecraft, we now have a second  decidedly more elegant  way to get around.